The wares of an herb vendor in Paracho. We went to Paracho again a couple of weeks ago, in April. Chon was anxious to go because he didn’t want to lose the opportunity to buy a guitar that Don Luis Silva had made about 40 years ago. It had been sold then to a young woman who bought it as a gift for her fiance”. Many years later, last December, Don Luis saw the guitar again. A man showed up from Mexico City because of his label in the guitar, and Don Luis remarked to us that the man seemed sick and rather disinterested. The guitar was in serious need of repair, having broken places of the back, and a cracked neck. It looked as though it must have been involved in an altercation or accident. Don Luis offered to send this rooster home with us. We declined. Don Luis recognized his guitar right away, and asked about the young woman who had bought it. Evidently, she and her boyfriend did NOT marry as planned forty years ago, and Don Luis could not discover the relationship between the young man and the long-ago boyfriend. Don Luis promised to repair the guitar, and hold it for one month. The man said he would return to pick up the repaired guitar in January, but he didn’t show up. Don Luis made many calls to the number he left, but his calls remain unanswered. Don Luis’s SON Juan who works with him said he should sell it to Chon, who was interested in the story, as well as the guitar. We have it now, to the consternation of the OTHER son, our friend Daniel, who originally helped to make it when he was young man, and is still expecting the man to show up for the guitar. Don Luis Silva’s guitar workshop. Chon is excited about the guitar because it is so old (read well-cured and dried, something that doesn’t always happen there; many guitars there are made quickly, with wood that is not completely cured). And it is Big – it has a deep body and an appropriately rich sound. Wedding procession in Paracho – very festive! While we were at the workshop a truckload of people celebrating a wedding drove by, followed shortly by this cart. And as Chon was visiitng with Don Luis I walked a couple of blocks to the entrance to the town. Here’s the view from the workshop. As I continued my walk, I passed a drainage ditch with one of my favorite flowers, called mosca, or fly. Mosca likes to grow in cracks, and it sends out baby plants to nearby spots where they can root. The flowers are like tiny violets. I had tried to transplant mosca with little success. But last planting season, some just showed up in our yard – in a pot! Mosca, a creeping plant with tiny sweet flowers. So – that was the reason for our trip, which turned out to be very, very interesting, and was not our typical leave-early-in-the-morning-and arrive-home-in-the-evening sort of drive. We got to Carapan (CarApan), the turn-off to Paracho, and there were soldiers there, telling us that the ill-named “highway”, narrow, and full of twists and parades of heavily loaded trucks to Paracho was closed, and if we wanted to get there we had to find a different route. As we drove further along the same road, with fields of raspberries and strawberries on both sides, we passed through several small towns along the way until we decided to ask for directions. Chon is uncannily good at chosing people to ask for directions, and this time he chose a man and a woman obviously waiting for a bus. The man turned out to be a taxi driver. He gave us directions, but they were overheard by a man preparing elotes to sell, who told Chon to get a paper and pencil. He did that, and the man gave us a lengthy list of towns to go through for our new route to Paracho. His list of towns we would pass through read like this: turn left to Tangancicuaro; go toward Patamban; go through San Jose, Cumicho, Cucucho and Nurio. IAt the temple in Nurio turn left to Paracho. We had to go Up through the mountainous area. We only made one wrong turn of about 10 miles, and went through beautiful small towns with many native Indians in their colorful dress. We arrived at Daniel Silva’s workshop. He had repaired two cracked guitars for Chon. He and his wife were there, and the workshop seemed very quiet because their teen-aged and older kids who had been there the last two times we visited had returned to school. Daniel told us what had happened to cause the road closing. His wife who helps in the workshop, prepared slices of wonderful mangos for a refreshing treat, so we sat and chatted, and Chon played the repaired guitars and gave Daniel a lesson in how to play a guitar piece he wanted to learn. And Daniel played for us, too, suggesting that Chon write a song with Purepecha rhythm, a 6-8 rhythm similar to huapango. He sang us a song in the Purepecha language, with that rhythm, too. It might have been called “Cristinita”). Two towns close to Paracho are long-time enemies, with many unfriendly altercations between them over many years. In the last year or so the government (which has for many, MANY years mistreated and misrepresented the majority Indian population there) promised some “help” to ONE of the towns. The other town complained, there was some kind of demonstration, and the two enemy towns began shooting at each other. It was reported that 8 from one town and 5 from the other town were killed. Thus the road closing. I later located a report on CNN that left out many details (and the article may have been distorted by my understanding anyway). I had thought that closing a road for two days was over-doing it, but now that I have heard more of the story, I am sure that the road will be closed for a while longer. I am imagining over-wrought, grieving families at their nightly 9 days of prayers for the dead, and the tearful and angry family conversations following that. There is a community support organization for the two towns, and I imagine that even those meetings have been suspended. In the afternoon before our drive home. we walked to the mercado, which is as colorful as any I have seen. It was a warm afternoon. Sometimes you can catch a glimpse through a door or hallway into a home. Our morning drive to Paracho had taken us through a small mountain town called Cocucho where we immediately spotted pottery on the street in front of workshops that looked different from any other I had seen in Mexico. The color was mixed dark browns with streaks and spots of black. We later found out that like Paracho, famous world-over for guitars, these two towns are world-reknowned for their unique pottery. On the way back down through the mountains from Paracho we stopped at one of the pottery places marked by a very old, rusty hand-painted sign (see below). The owner said that just that day he had sold many of his large pots to a man from Chihuahua who had stopped in the morning. All of those purchases were tied with ribbons to mark them. The buyer had evidently gone to get packing material in Paracho (or maybe some guitars!). A purchase transaction in action. Loading our treasure in the back of the car. You can see just the mouth of one pot beside Chon. Chon bought two tall pottery vases (I guess you would call them – the potter just calls them “ollas”; just “pots”). The maker told us that if we put water in them, the water would eventually leak out, but the pottery would not be damaged by the water or by rain. I’ll add a photo of the two pots in another post. We later discovered that the regular purchase price is several times more than what we paid! I was in the parked car across the street from the workshop as this transaction was happening, and a woman in the store I was parked inches from had a handful of clay and was working it. Soon a little boy came our from the store carrying something I could tell was pottery. When he turned it around so I could see it, it was a representation of a cantina, about a foot long, and perhaps four inches wide. There were tables and chairs, and men in various states of drunkenness. The woman tried pretty hard to sell the scene to Chon, but he had already bought the vases, and thought the price for the little scene was too much compared to the tall, graceful, masterful vases he had just bought. This photo was taken through the car window. That’s the boy who made the pottery cantina – Chon is holding it. 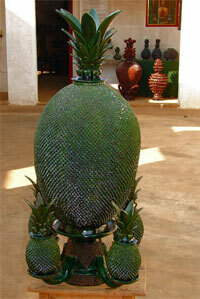 In another town close by, San Jose De Gracia, there was more pottery, glazed with green, in the shapes of pineapples. There are other shapes, and other colors, but the green pineapples are typical. Not my photo – it’s from a website offering these typical gorgeous green pineapples. Peaceful afternoon view of a square templo in Aranza. The Purepecha Indians there are beautiful people, and their dress, especially that of the women, is spectacular. They often wear very colorful embroidered blouses. They wear skirts that are fitted to the hip, then burst into many, many pleats. They fabrics they favor are probably not what you would expect – they are mostly fabrics with sheen, probably polyester and blends. The length of the skirt varies – some women wear the skirt almost to the ankle, and others covering the knee. Almost all the women wear beautifully woven wool rebozos of different colors and designs, sometimes wrapped around their heads (or around a baby carried on the back). Even very small girls wear a similar dress. Over the skirt they favor very fancy aprons of contrasting color, sometimes embroidered, and often trimmed with extravagant lace. Their shoes may be leather flats, heels, or huaraches. At one stop for directions I saw two lovely teenaged girls sharing the same rebozo over their shoulders – very sweet! I was lucky to catch this photo. See the apron, the pleats, the beautiful blue rebozo? When you come to visit us, I hope we can take a two-day trip to Paracho and go through the mountain and valley towns. It looks a lot like the area near Sonora, California, and the towns are beautiful, old, charming. You’ll probably enjoy the visit as much as I do. These are popular paint colors for houses and stores. This entry was posted in Cocucho, driving in Mexico, guitar-making in Mexioo, Paracho, pineapple pottery, San Jose De Gracia on May 5, 2012 by gubabbaboy.